I can never say it enough, but I love comic books. I'm sure I've mentioned it once or twice here and there, about how comics have greatly influenced my life and how I live it. Well, I forget how I came across this comic collaboration, but as soon as I did I fell in love with it. 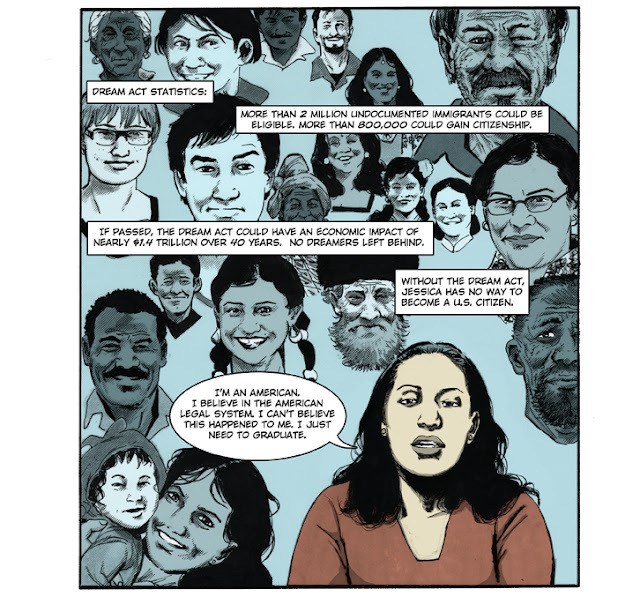 The story of one dreamers experience being shared through the comic medium. The story, "Jessica Colotl: Eye Of The Storm" follows Jessica's experience being detained and put in an immigration detention center and her eventual release after her community worked to get her out. And as fucked as her experience is, it's one that happens to countless immigrants everyday, but not everyone can stand up for themselves like Jessica. Between the language barriers, fear of authority and the bureaucracy that catches people, most folks end up being deported or being held for long periods of time without being able to contact family members. The story and comic was put together by Reporter Ryan Schill and artist Greg Scott. If you get a chance, please do check out the comic. You can also read the spanish version here. The fact that an undocumented immigrant addressed the DNC last night is a historical moment, even if all of mainstream media didn't air it or acknowledge it. That being said, the speech Benita made was just for show and tell. I'm sure given the circumstances, her speech was pre-written for her and composed entirely of messaging that only pushed the obama administration's messaging. That he's for immigration reform, that deferred action was something he decided to do and that he needs latino votes. We all know that's a completely lie.